Sun City Shadow Hills and Sun City Palm Desert, located in the Greater Palm Springs Area, are akin to small cities within a city. As such, there is over 8,500 homes in these two communities alone. This makes for a specialized home marketplace for home buyers and sellers unlike any other in Southern California. The Sun City Insider works with the local real estate experts, the Jelmberg Team, to provide these insights on the factors affecting the number of homes for sale, model types and more. Stay tuned for monthly updates that will help you in the sale or purchase of a Sun City home. The local real estate market is one of the most important considerations to people living in, or interested in buying a home in Sun City Shadow Hills or Sun City Palm Desert. 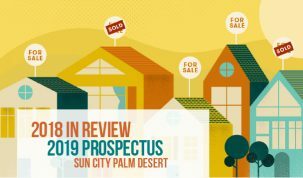 This section of the Sun City Insider dives deep into market trends, news, home sales that directly affect both Coachella Valley Sun City communities. In this section home buyers and sellers or interested parties can find information on real estate listings, home evaluation, home sales based on floor plan type, recent sold data, trends and real estate related articles. Home prices and sales are complied to give home buyers and seller accurate insights into home values in these communities. Beyond the number and statistics, there are many factors that may affect home prices in the area. The Sun City Insider works closely with the local real estate gurus The Jelmberg Team to determine these trends and data. With this valuable information the Sun City Insider can provide readers a deep understanding of the in-and-outs of buying and selling a home in these amazing Del Webb communities.